That would be fun, thank you! Beautiful giveaway. Looks like a interesting book. Thank you for the opportunity to win this book, Lori! Looks like a fun project book. My favorite place to buy yarn is online - I love browsing all the colors. Thanks for the chance to win this book. 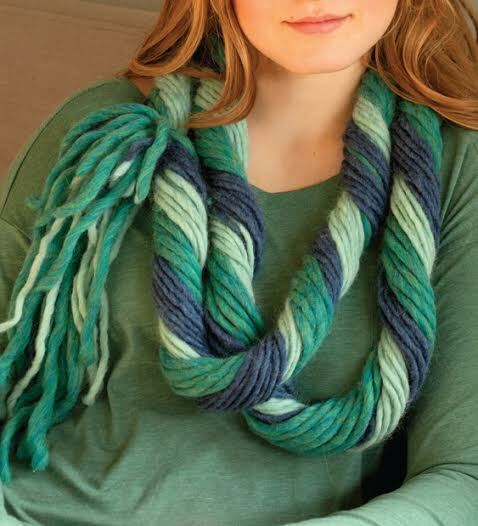 It looks like there are all sorts of fun projects to try, and since I don't knit it's perfect for all the pretty yarn I see in stores. I usually buy my yarn at JoAnn's or online. Great giveaway! I get most of my yarn at Joann's or Michaels. I Know this book would help me creatively use my stash. This sounds like a great book. My yarn stash is in my son's old dresser with each draw holding different types of yarn. I usually get mine at Hobby Lobby or Michael's. Oh gosh, that chair is so fun! I would love o win - that pom pop chair would be incredible fun! What fun it would be to own this book! The projects in this book look really fun!! 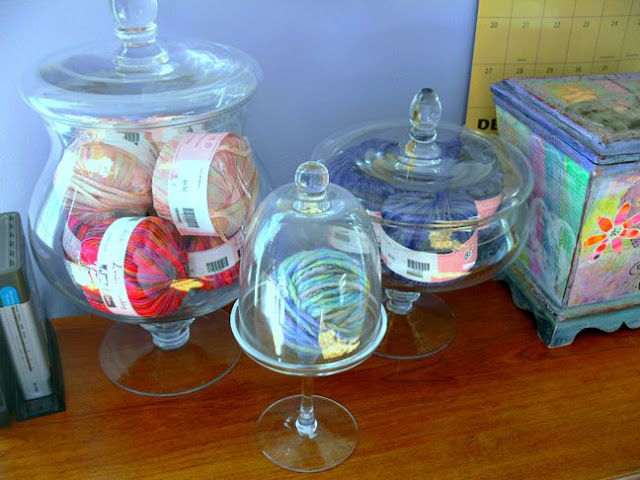 We all have leftover yarn to get rid of! I'm not a knitter (I do bead stitching, sewing, and embroidery). This is a great idea for a book and there are several projects I've seen on this blog and some of the others listed as well. Specifically the hanging lamp shade and the spiral rug (or table runner, or placemat, or...). I have all my grandmother's knitting needles and crochet hooks. I've never used them, but I'm also not able to part with them. Maybe I'll learn to use them after all. 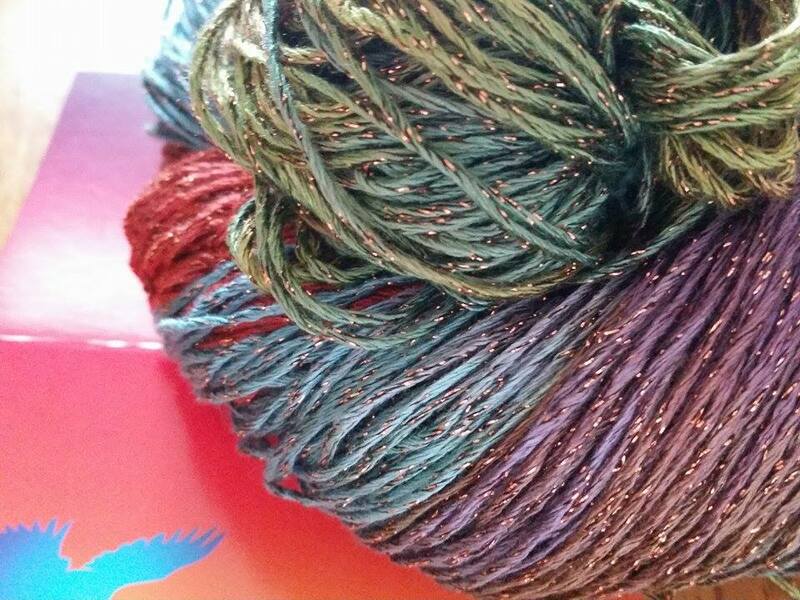 I love to buy yarn at Joanns, my local yarn shop and online. My stash is taking over! I'd love some fresh ideas. Thank you for the chance! Unfortunately, there isn't really a good place to buy yarn around here. I have to get it from walmart. This would be a great resource when trying to shrink the stash! 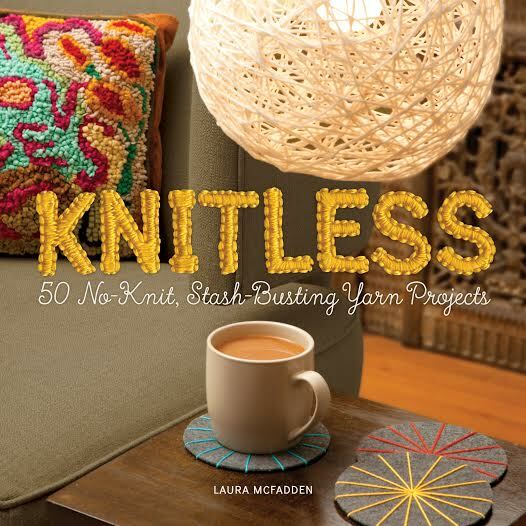 Having just organized my yarn stash, and knowing it is definitely SABLE, I could really use this book. Yep, my house would have pom pom furniture! (Dining chairs are HARD!) And my kitties would probably love the poms. Love it! 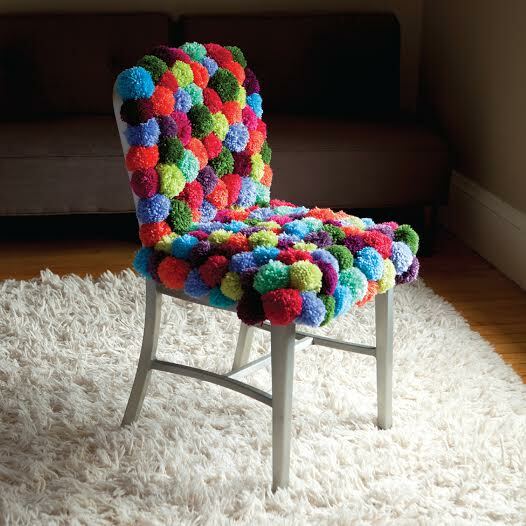 That pom pom chair, oh pahlease to die for! !